How do you unstick a cruise ship wedged under a bridge? With a couple of smaller boats, it turns out. Tugboats work to free the Captain JP III cruise ship Friday. The Captain JP III – a cruise ship that unmoored in upstate New York Friday morning and found itself lodged under a railroad bridge – has been freed by a pair of tugboats, according to the New York Department of Environmental Conservation. 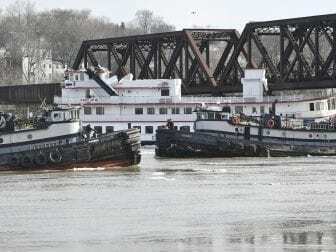 Eight vessels broke loose from their moorings on the Hudson River Friday morning, amid rising water and ice jams, and floated south, according to the DEC. The department confirms to NPR that all of the runaway vessels, which consist of five barges, one tug boat, a “dock system” and the cruise ship, have since been corralled. Drone footage from the DEC shows the unmanned Captain JP III, a four-deck vessel from the Captain JP Cruise Line, dragged downstream by the current until it reaches an impasse: a railroad bridge too short to allow the ship to pass. The same footage reveals that other ships had better luck. Just ahead of the Captain JP III, another vessel makes a sweeping turn in the water, slides under the bridge and continues its languorous journey downstream. A third vessel in the video skirts the snugly lodged cruise ship and glides beneath the bridge. Several bridges were forced to close during morning commuting hours because of the loose vessels, according to the New York State Police. But other business continued as usual: One picture shows an Amtrak train crossing the Livingston Avenue Bridge while the Captain JP III sits lodged underneath.